The Spraymagic tap inserts are a simpler, low cost alternative to the Tapmagic range. It's a universal spray device that converts a standard tap into a spray tap in minutes. Designed for home and commercial premises the device converts water flow into a soft spray. 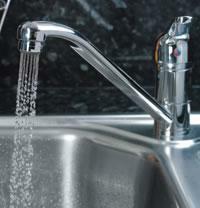 It doesn't have the dual flow capabilities of the Tapmagic, but it still provides the same substantial water savings. It's suitable for hot and cold water applications including mixer taps. Easily removed for cleaning and de-scaling if required. Suitable for low to medium pressure systems. Fits round outlets 15mm - 19mm. To install the Spraymagic cartridge models simply unscrew the existing chrome housing and replace the existing plastic water strainer with the Spraymagic cartridge. A low cost and simple solution to water wastage at the tap. Can be fitted with a standard or security fixing. Once installed the unit is unobtrusive. Fits M22 externally threaded taps. Fits M24 internally threaded taps. Fits circular outlets from 15-19mm. Be the first to submit a review for the Spraymagic Single-flow Water Reduction Cartridges.